The No. 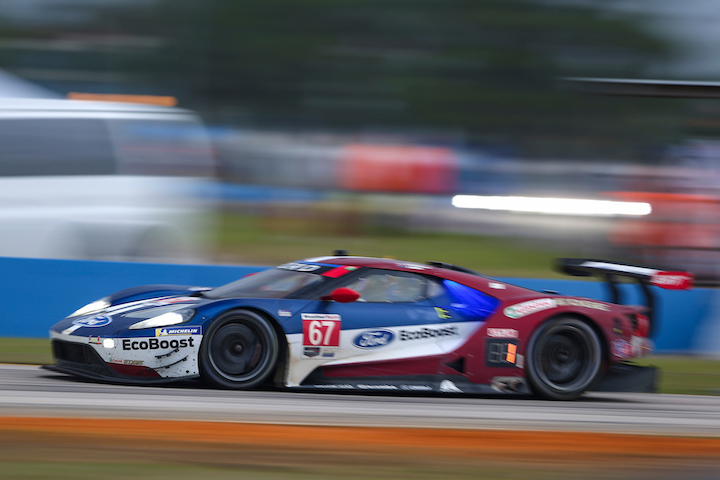 66 Ford GT of Joey Hand, Dirk Mueller and Sebastien Bourdais finished second in class in the 2019 IMSA 12 Hours of Sebring, while the No. 67 Ford GT sister car of Ryan Briscoe, Richard Westbrook and Scott Dixon suffered an unfortunate end to the race and finished sixth. The No. 67 Ford GT led the majority of the race in GTLM and was running in the top three when a late-race caution came out for a stricken BMW M6. This set-up a frantic 10-minute sprint to the finish between the No. 66 Ford GT, No. 67 Ford GT and No. 911 Porsche 911 of RSR of Nick Tandy, Patrick Pilet and Frederic Makowiecki. When the green came back out, Briscoe spun out from second, allowing the No. 66 Ford GT to pickup the position. The No. 911 Porsche led to the finish, which previously inherited the lead after Tandy passed Briscoe for second and the No. 3 Corvette C7.R was forced to pit from first. The No. 67 recovered to finish sixth overall, while the No. 66 team narrowly missed out on the win and finished second to the No. 911. The Corvette looked to be in good position to inherit the win, but Tandy didn’t realize the team would have to pit late in the race, which ultimately forked the lead over to him.